Winners, WSOP famous players, online poker play and history. Poker is one of the most popular card games worldwide for passionate players whether it is Holdem, Omaha or Stud Poker. There are games online for everyone or for play at the kitchen table. Let’s show our cards and begin with general facts. The Big 3 games are Texas Holdem, Omaha and Stud Poker versions. Holdem and Omaha are current favorites; however, 7-Card Stud Poker has a long history and will never go out of style. Other poker variations are Pineapple Poker, Pai Gow Poker, 3-card Poker, Baccarat, Chemin de Fer, Pusoy/Chinese Poker and Badugi Poker. Some of the less played or oddity poker variations are Whiskey Poker, Bull, Indian Poker, Double Draw, Knock, Round the World and 2-card Poker. There are a possible 2,598,960 hands of poker in a 52-card deck. The odds of a Royal Flush are 649,740 to 1. There is one chance in 500 of drawing a flush when playing Poker. First person said to have invented and played Caribbean Stud was David Sklansky. Razz originated in the 1900s but was not introduced at the World Series of Poker until 1971. 5 Card Stud is also the name of a movie about poker from 1968. Single table SitNGo is the fastest growing online version of poker. Red Dog Poker was invented in the 1800s. Baccarat is recognized for attracting wealthy players and casinos can and have lost millions overnight to these Very Important Players. Pai Gow poker is an American version of an ancient Chinese game involving dominoes. Let It Ride Poker is one of the newest and youngest forms of poker introduced in 1993. Let It Ride Poker was invented by the Shuffle Master company as a promotional tool for getting their machines into casinos. H.O.R.S.E. is a form of poker known as Mixed Games usually played at the high stakes tables. It consists of rounds of play changing among Texas Holdem, Omaha, Razz, Seven Card Stud and Seven Card Stud Eight or Better. No winner of the World Series of Poker has ever won the last hand holding pocket Aces. Gus Hansen holds the most World Poker Tournament titles. There are only two players to win the World Series of Poker main event three times, Stu Unger and Johnny Moss. The 10-2 is called the Doyle Brunson because he won the World Series of Poker main event in back to back years holding it. Johnny Chan kept an orange at the poker table to have something to smell if players start smoking. Chris Jesus Ferguson throws playing cards at a lightning speed of 71mph and has been known to cut through bananas and melons with a card. The most famous actress to win a World Series of Poker bracelet is Bride of Chucky starJennifer Tilly in 2005. The most famous actor to win a World Series of Poker bracelet is Ben Affleck in 2004. Although he has never won a tournament, it is estimated that Tobey Maguire has won more than $10,000,000 playing poker. Richard Nixon was an avid poker player. President Obama plays the game and is reputed to be an excellent bluffer. The oldest person to win a World Series Poker bracelet is Paul Cigar McKinney who was 80 years old when he won in 2005. David Chip Reese and Freddy Deeb are the two players who won the H.O.R.S.E tournament. It is estimated that Stu Ungar won a total of $30 million from his poker career. The highest stakes game ever recorded was a Holdem game played by billionaire Andy Beal. The stakes were $200,000. The buy in for the first Poker Super Stars Invitational Tournament was $400,000. Men Nguyen has won the most Card Player’s Player of the Year award. The original three members of the World Poker Tournament Walk of Fame are Doyle Brunson, Gus Hansen and Phil Garner. Japanese property developer, Akio Kashiwagi is on record as the world’s leading gambler. He bets $20 million an hour. He won $19 million in 1990 in a casino at Darwin, Australia and $6 million at Trump Plaza, Atlantic City. The first online poker room was launched in 1998. To date, the largest online poker win was for $1.3 million during a heads up $500/$1000 pot limit Omaha session in November, 2009. California has the highest rate of online games with more than $2million people playing in the state. If online poker was authorized in California, the revenue produced would be around $1.4 billion. Poker facts trivia reports that New Jersey recently legalized online poker in the state and to increase revenues, other online gambling statewide is likely to follow. An online gaming ban was introduced in September 2006. This was not a poker ban and it is still legal to play online poker in the United States. It is estimated that Americans spend over $13 million playing poker at offshore websites across the world. 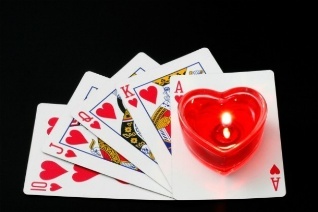 It is rumored that poker originated in the US in New Orleans Louisiana with just 20 cards. As it spread through the west, the 52-card English deck was introduced into the game. A fifth suit was added to the deck of cards in 1937 but it never caught on, as people did not want to buy new cards. Each king in a deck of playing cards represents a famous historical king: Spades=King David, Clubs=Alexander the Great, Hearts=Charlemagne, Diamonds=Julius Caesar. The inventor, John Montague frequently played poker and would demand his staff put his meat between two slices of bread so he could continue to play at the table. The Dead Man’s Hand refers to aces and eights because Wild Bill Hickok was holding this hand when he was shot at the poker table. You are more likely to win from other players’ mistakes than your own skilled play. Poker game software is an indispensable tool for a new or veteran player. It provides the best simulation of the game to train for the game, run reports, show statistics; display information about one’s game by reading hand histories of one’s opponents. Remember, the majority of people who lose at poker directly relates to their lack of knowledge.